This is applicable to all lifters that compete in raw, drug free powerlifting competitions in federations that enforce below parallel squats and paused bench presses. Elite: An exceptional lifter, for males this means the lifter is very likely in the top 10 in the nation for their respective weight class and the lifter may be close to a top 5 ranking among comparable federations for that competition year. For females this means the lifter is very likely in the top 5 in the nation for their respective weight class and the lifter may be close to a top 3 ranking among comparable federations for that competition year. Elite lifters generally place very well at local level competitions and will usually hold their own at National level competitions. It is not uncommon for Elite level lifters to have 10+ years of experience with serious powerlifting training. Approximately 1% of competitive powerlifters will reach the Elite level of classification. Master: A very skilled lifter, for males this means the lifter is likely in the top 50 in the nation for their respective weight class among comparable federations for that year. For females this means the lifter is likely in the top 20 in the nation for their respective weight class among comparable federations for that competition year. Master lifters usually perform quite well at local level competitions and may want to think about competing on a National scale. Master lifters are likely to have 6+ years of experience with serious powerlifting training. 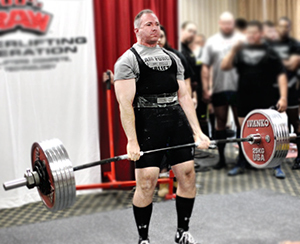 Approximately 10% of competitive powerlifters will reach the Master level of classification. Class I: A skilled lifter. A Class I lifter is significantly stronger than the average person that engages in regular intense weight training. Class I lifters are likely to have 4+ years of experience with serious powerlifting training. A high percentage (~30%) of competitive powerlifters are at the Class I level classification. Class II: A relatively skilled lifter. A Class II lifter is stronger than the average person that engages in regular intense weight training. Class II lifters are likely to have 3+ years of experience with serious powerlifting training. A high percentage (~30%) of competitive powerlifters are at the Class II level classification. Class III: A Class III lifter is stronger than the average person. Class III lifters are likely to have 2+ years of experience with hard resistance training. A reasonable number (~20%) of competitive powerlifters are at the Class III level classification, this classification is common among teenage and upper level master lifters (50+ yrs old). Class IV: A Class IV lifter is at the beginning stage for a powerlifter. Class IV lifters are likely to have 1+ year of experience with hard resistance training. A smaller number (~10%) of competitive powerlifters compete at the Class IV level classification. Why were the numbers revised? Initially the goal was to simply create a classification system for the individual lifts based off of the system that was currently being used to classify a lifter’s powerlifting total. After further examination it became apparent that the current system was not quite describing what we were seeing on the platform. Just a few people each year were hitting elite at the lightweights, even with a large number of competitors, and a large number of people were hitting elite at the heavyweights, the terms were not balanced. An attempt has been made to more properly align the standards so that elite at 148 means approximately the same thing as does elite at 242. Standards have been established for each individual contested lift and the numbers for the powerlifting total standards have been slightly revised. How did you come up with the numbers? The primary resource that was used to calculate actual numbers instead of expected numbers was the lifter rankings system on PLwatch.com. Information from the years 2008, 2009, and 2010 were primarily used. PLwatch.com does not separate by out federation standards and/or if lifters are drug tested so we had to further examine the rankings based on those qualities. Those numbers provided the backbone for the Elite standards, however several lifting formulas were also used, input was given from federation officials, and patterns were analyzed. The other rankings (Master through Class IV) were set up to maintain a similar standard in relation to the Elite rankings as occurred in previous years. Why do we need 4 classes of lifters plus Elite and Master, why not fewer classes? Powerlifting is a sport that accepts all comers, some great lifters, some not so great. Some lifters are at the tail end of their sporting career and others are just getting started. In addition general gym goers that lift weights but don’t compete like to “look in” to get a sense of how they might fare in a competition. The 6 rankings helps separate out those lifters that are at the top of their game to those lifters just getting started and everywhere in between. While it is true that the significant majority of full meet lifters will be class II or above, the standards for the single lifts are higher and many lifters will find themselves working hard to simply place on those standards, let alone shoot for a Class I or Master level or beyond. Multiple standards can inspire a lifter to get that extra 5 or 10 lbs on a lift, if one is so close to that next level it might be the motivation they need to hit that weight. Finally powerlifting as a whole is inclusive, not exclusive. It is not just a sport for the “super strong” among us, it is a sport for all those lifters that want to test themselves in a competitive setting and to see what their own personal limits may be. If lifters disapprove of the lower classes they can simply ignore them. First, the powerlifting total standards have been revised, although not greatly. In general the light weight standards have been lowered slightly, the middle weights are relatively unchanged, and the heavy weight standards have been raised slightly. Secondly there are standards presented for each individual lift which is a new idea. The individual lift standards can be applied to both a full meet and a single lift competition. Why don’t the standards on single lifts add up the standards for the total? The single lifts standards represent the ability to specialize, if one only trains the bench press it will be easier to improve just that than if one divides up their resources among additional lifts. Thus a good all around lifter whom is Class I in most lifts might actually be a Master lifter when examining their total because they have no weak points. Why are the standards higher for females than males relatively speaking? Fewer women compete than men, it can be assumed that if more women were to compete there would be more good lifters. Why aren’t the jumps between weight classes more even? The jumps in weight between the weight lifted in weight classes was based on actual performance, not expected performance. For some weight classes and lifts there was a minimal advantage in being just one weight class heavier, in others there was a very significant difference in the performance of the lifters. The standards were set up in general to classify what lifters were actually doing on the platform instead of what was simply expected of them. I know a lot of people that can hit the Elite numbers, are your numbers right? It is natural with any sport that the more accomplished lifters receive more press and recognition. Elite in this sense does not mean one is guaranteed to be a National Champion or a World Class lifter, although both of those lifters would be elite. Elite simply means very good. When looked at nationally there will still be a reasonable number of elite lifters per year. If you think you have seen a lot of people train in the gym that could be elite, it is likely you might not be familiar with the standards set forth to complete the raw powerlifts in a competitive setting and you may not be aware if those other lifters are drug free or not. The rankings on PLwatch.com confirm that an elite level performance to the standards set is relatively rare. If you think you really know some people that could hit these numbers but they don’t currently compete, suggest that they go and lift in a competition, they should be very competitive. Aren’t these standards too high? The standards need to be moderately high in order for them to mean anything. If 50 people in each weight class are hitting Elite then it lessens the title. You personally might have your own definition of Elite and Master and so on, these standards are based on the operational definitions put forth at the beginning of this article. Aren’t these standards too low? They were based on the rankings on PLwatch.com. It is likely that if all competitive powerlifters competed in the same federation under the same standards, there would be more “elite” level lifters than the numbers here and the numbers might need to be revised. However, use of powerlifting equipment, strictness of judging, and drugs all play a significant role in the numbers lifters can put up. If more people want to come and lift under these standards and prove them too low, so be it. Until that time all we can use is the information we have. Will you revise these standards? Yes, the plan is to reexamine them in 3-5 years and see how they are holding up. If they are still adequately describing the type of lifting seen then it will not be necessary to revise them. If many more lifters are achieving the designations put forth then the standards can be revised. The curl was actually included in the first powerlifting competitions in the 1960’s but it was dropped after a few years, likely due to the time a full powerlifting meet takes as it is. The curl has been reintroduced lately in several federations to test the strength of the arms. These standards apply to a strict curl (up against the wall) using an EZ bar. For those that like this lift, it is meant as a guide, for those that don’t like this lift, ignore it. The curl is not added to a lifter’s total, it is a stand alone event. Why don’t the Elite numbers on Curls increase after the 242 weight class? So far there has not been a noticeable increase in curl strength in the heavier weight classes so the standards reflect that. How did you come up with the curl numbers? Because less people compete in the curl the standards are higher. The elite number would generally give a lifter the first or second ranking for the curl in that weight class that year for that federation. As more people compete in the curl those numbers might rise. The curl numbers can be revised in 3-5 years if necessary as well. How come the Master lifter is closer to Elite than the other categories? The Master lifter ranking is closer to the Elite lifter ranking from a percentage point of view than the other rankings because of the fact of diminishing returns. In the beginning lifters start off using low weight but make great progress. The more experienced the lifter gets the slower the gains come. Once a lifter has reached a high level of proficiency adding another 5 or 10% to their strength can be quite a challenge. If I am not at a Category IV level am I too weak to compete in powerlifting? Powerlifting is more about competing with yourself and better yourself than lifting a certain amount of weight. If you can lift the bar and you enjoy testing yourself in a competitive environment, powerlifting is for you. You will very likely find the atmosphere at a powerlifting competition to be quite supportive, almost all good lifters started out pretty weak at some point so they can relate to where you might be now. In addition if you are older (50 + years old) or younger (<18 years old) of course it is less common for those lifters to lift extremely high amounts of weight. You can use this information to assess your strengths and weakness as a powerlifter. If you are a Class I bencher but a Class III deadlifter it means your deadlift is a weak point for you and likely needs more work. You can use these standards as a motivation tool to lift more weight. You can use these standards to see if moving up or down a weight class is likely a good idea for you. If you can move up a level by gaining or losing body weight it is a likely good idea, if your relative classification goes down then it is likely not a good idea. Finally you can acknowledge your accomplishments and hard work by purchasing certificates that designate your ranking with a particular lift in a certain competition for that year.